Watching birds and bees in slow-motion flight is like witnessing an impressive display of aerial ballet – they are capable of acrobatic manoeuvres, swooping past obstacles and correcting their flight path with ease. Compare this to the flight of an Unmanned Aerial Vehicle (UAV), which often looks slightly uncoordinated and clunky. The remote human operator needs to work hard to maintain a flight path, and has to constantly watch out for obstacles. UAVs, also known as drones, have an important role to play in commercial, communication and military technology, so the ability to improve their flight and work towards them operating autonomously is of huge importance. A team at Queensland University is studying the flight characteristics of budgerigars and bees, and using these to improve the flight mechanics of their drones. The team, led by Professor Mandyam Srinivasan, are studying how bird and bees use their vision to fly safely and efficiently, including navigating obstacles and controlling their height above ground during flight. Drones are becoming more and more commonplace in our skies, with a range of firms investing in drone technology, including military, communications and delivery companies. So uncovering the secrets of why birds and bees flight is so efficient and effective will potentially play a very important role in improving the flight capabilities of drones in the future. Srinvasan says that the biologically-inspired principles they are studying will go towards creating a new age of autonomous drones that don’t require any input from external sources like GPS or radar. It’s anticipated that these drones will be extremely useful in surveillance, rescue, defense and even planetary exploration. Many firms are now investing heavily in drone technology, anticipating that their use will become more and more common. BT has invested in drone technology, with the aim of using drones to firstly assess damage in battlefields, disaster zones and other hard-to-reach areas. Once the damage has been assessed, it is hoped that the drones could also provide internet access to the area, in combination with tethered balloons. This is important in improving communication for those trying to access a war-torn area or somewhere devastated by a natural disaster where internet and phone signals have been compromised. The United States is also experimenting with new drone technology. In February 2017, the US military launched 103 miniature drones from a fighter jet. These drones are capable of swarming, operating autonomously and it is hoped that they will be able to bypass air defense systems. Many retail companies are also realizing the potential benefits that drones could bring their businesses. Amazon has started a trial in the UK, delivering packages by drone in the Cambridge area. The aim is to explore three key areas: flights beyond the line of sight, avoiding obstacles and the use of multiple autonomous drones. UPS is also testing drones in the US, exploring the possibility of making deliveries to remote locations. Drones are also being used at energy plants. Shell has started using drones at oil and gas plants in hard to reach places such as off-shore oil rigs, which it hopes will be safer and more efficient than using people to perform the same task. With the anticipated increase in drone activity comes a necessity to improve their reliability and ability to operate autonomously and it is this that the team at Queensland University are focusing on. 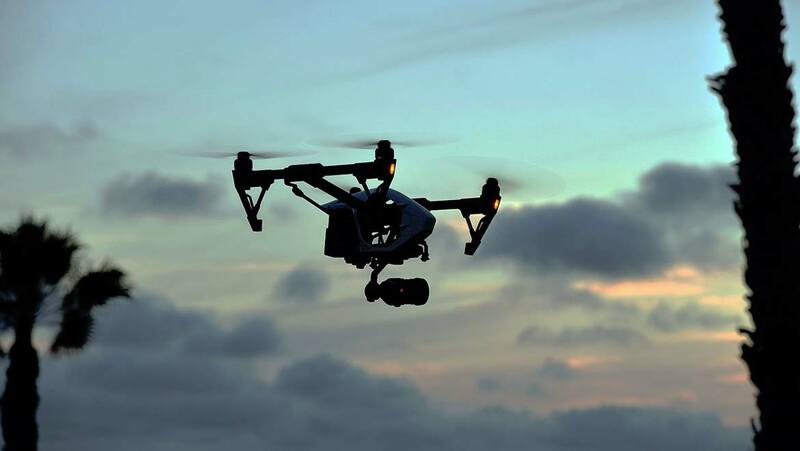 Some potential dangers for drones during flight include shadows, reflections and obstacles, all of which are navigated with ease by birds and insects. Whilst birds and bees have very different physiology, both animals have visual processing centers that make them incredibly efficient at flight. Bees, despite their tiny size, are able to successfully navigate to food sources over 10km from their hive. Birds are capable of incredible aerial acrobatics and navigate successfully over thousands of kilometers when migrating. The flight behavior of both animals was observed using high-speed cameras and 3D reconstruction. The team then use this knowledge to design vison systems and algorithms to help guide their drones. The plan is for drones to be able to navigate independently just like their biological counterparts, without the need for radar, GPS or a human at the controls.